LOCATION.--Lat 43°42'44", long 74°58'12" referenced to North American Datum of 1927, Herkimer County, NY, Hydrologic Unit 04150101, at dam on Middle Branch Moose River, 100 ft upstream from bridge on State Highway 28 at Old Forge, and 11.2 mi downstream from dam on Sixth Lake outlet at Inlet. PERIOD OF RECORD.--October 1969 to September 2003 (month-end elevations or gage heights, and contents). October 2003 to current year. Prior to October 1971, published as "Old Forge Reservoir". Records from November 1911 to September 1969, available from Board of Hudson River-Black River Regulating District. GAGE.--Water-stage recorder and nonrecording gage read once daily. Datum of gage is NGVD of 1929 (levels by Board of Hudson River-Black River Regulating District). To convert elevations to NAVD of 1988, subtract 0.11 ft. Prior to 2004 water year, only nonrecording gage read once daily. COOPERATION.--Elevation record and capacity table (1959) provided by Board of Hudson River-Black River Regulating District. 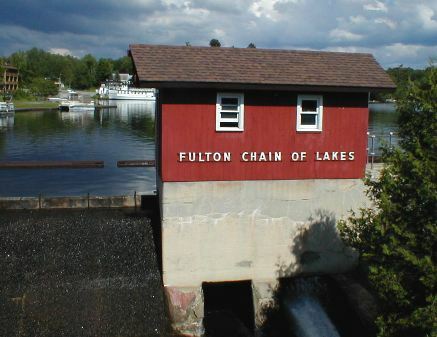 REMARKS.--The First through Fifth Lakes of Fulton Chain Lakes are partially formed and controlled by a concrete dam with 12-inch flashboards. Storage began around 1881 or 1882 with a wooden crib dam. This dam was replaced with a concrete dam in 1905 and gates were installed in 1927. Usable capacity, 895.6 mil ft³ between minimum operating level, elevation 1,696.8 ft, and crest of spillway with flashboards, elevation 1,707.04 ft. Usable capacity without flashboards, 764.3 mil ft³, elevation 1,706.06 ft; no dead storage below minimum operating level. Figures given herein represent usable contents. The dam is operated by Board of Hudson River-Black River Regulating District. EXTREMES FOR PERIOD OF RECORD.--Maximum elevation observed, 1,707.93 ft, June 17, 1972, contents, 1,019 mil ft³; minimum elevation observed, 1,699.8 ft, Nov. 3, 1939, contents, 6.50 mil ft³.